The Cruiser II walker is an excellent choice for beginning gait training. 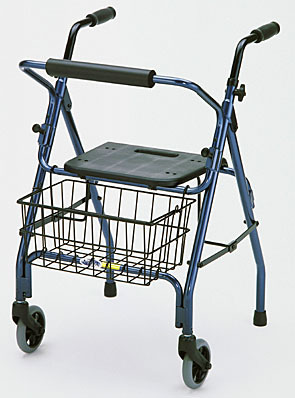 The large 5" wheels roll smoothly and the rubber tips on the rear legs prevent the walker from rolling away. The frame is more stable than the standard folding walker and provides the confidence necessary to establish a normal walking pattern. The seat and padded back rest offer a resting place when needed. Basket, seat and back rest are standard features on this model. The adjustable height handles will fit most any user.